Decorative Life: Many years. In fact, often seen in retail stores like barber shops and hair salons growing for years with little or no care. It is one of the longest lasting foliage plants under interior conditions. Consumers often take cuttings, place them in a glass of water in which they root and can last for months with seemingly little or no root oxygen. Applying the growth retardant paclobutrazol or uniconazole during production resulted in more compact, higher quality plants that performed better under subsequent interior conditions. Applying magnesium nitrate sprays to stock plants improves the color of cuttings and subsequent plants. Native to Solomon Island (Golden Pothos) and Borneo (Silver Pothos). Common relatives include philodendron, calla, anthurium and dieffenbachia. Plant is classed as a monocotyledon, leaves mostly parallel veined. Leaves are oval to triangular, leathery, 2-4 inches long, often with splashes of yellow. Mature leaves can become very large, up to two feet long under ideal growing conditions. Both genetics and production conditions greatly determine leaf color and size. Stems flexible, vine-like, needs support or hanging. Chill sensitive, store above 55F. Chill damage symptoms include brown patches appearing in the center of leaves and/or a grayish leaf color. Might be better known in the trade as Scindapsus aureus, Pothos aureus or even Raphidophora aurea. The specific epithet name “aureum” means golden, probably in reference to the gold-colored markings on the leaves and stems. These markings vary depending on cultivar and light levels during production. Several arum family members (including taro) are grown in tropical regions for their edible tubers, representing starch staples for large populations. 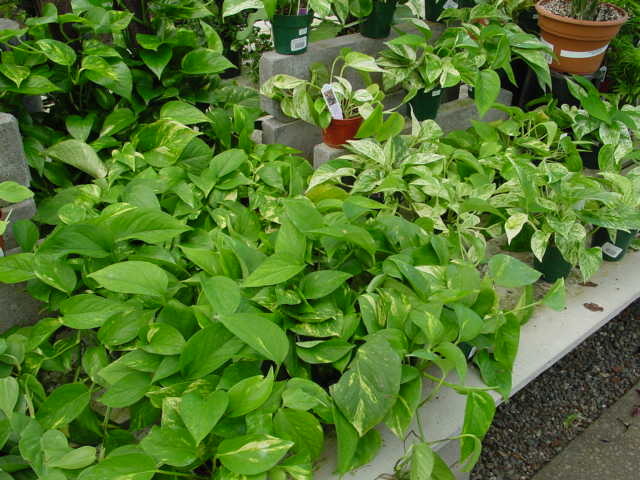 Many other species are grown as ornamentals for their beautiful foliage. Grows reasonably well with little light and with seemingly lots of neglect. During the “green revolution” in the 1970s, this species was one of many often sold to consumers before it was completely rooted. In one documented instance, cuttings were taken, planted in small pots, boxed and loaded on a truck for delivery to retail outlets, all in the SAME day! And, because of its tough nature, it is believed that most of them probably survived! The more the leaves are variegated, the more this species is sensitive to chilling temperatures. Poole and Conover (1993) stored ‘Marble Queen’ at 36-46F from 1-4 days and subsequently noted dead leaf tips and margins within a few days. As summarized by Brown (1988) of the work by Wolverton et al. (numerous years), this is one of many foliage and flowering plant species that can remove air pollutants such as formaldehyde and/or benzene often found in cigarette smoke from interior environments.